괴레메, 터키의 가든 케이브 호스텔 | 호스텔월드에서 예약하세요. 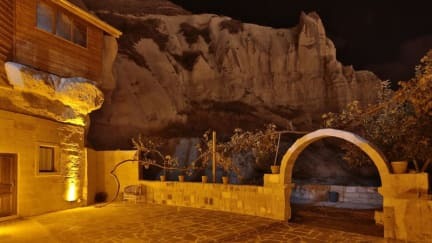 Garden Cave Hostel is Goreme’s newest hidden treasure. This family owned and run property offers a quiet oasis for the budget traveler. Enjoy the novelty of staying the night in a cave room, one of which used to house the family’s camels. Relax in the hostels enclosed terrace in the colder months or sit in the garden, overlooking the views of the unspoiled Goreme landscape. Enjoy a cup of Turkish tea with the hotel staff, planning your time in Goreme or simply sharing life stories. Garden Cave Hostel focuses on guest relationships; we aspire to have each guest leave as a long lost friend, not simply a hotel lodger. We look forward to welcoming you to our home. We are nestled in a quiet corner of the towns Gaferli Mahallesi backing on to Iceridere Valley. We are 5 minutes walk away from Goreme bus station. From our hostel, Goreme open air museum is 1.5 km, and Nevsehir airport is 45 km away. Garden Cave has recently been turned from the family home to a small 3 room hostel. The hostel offers dormitory rooms which can also be booked as privates, each offering 4 single beds and private modern bathrooms. Free WiFi is available as well as luggage storage. Cancellation policy: 5 days before arrival. Check in from 11:00 to 23:00 .